Liquid Ledger 2.0.4 is a good personal finance program with a simple, uncluttered interface that helps you track your income and expenses. It allows you to import transactions downloaded from banking institutions, gives you a good graphical summary of your financial status, and is capable of handling multiple currencies. But the program fails to make data entry as easy or as obvious as it should be, especially when it comes to basic features such as adding categories. It also lacks the kind of detailed reporting tools found in similar personal finance programs like Quicken ( ) or Moneydance ( ). Setting up a new file in Liquid Ledger is a snap. You can create a blank file with a default set of accounts and categories, or you can import a data file that you’ve downloaded from your bank. Liquid Ledger is capable of importing four data formats: Quicken Interchange Format (QIF), Open Financial Exchange (OFX), and comma- or tab-delimited text. It handled the import of my QIF files with ease. But when I attempted to import text files in comma-seperated (CSV) format, the program didn’t import the data at all. Also, when I entered new transactions manually, I found that the program didn’t work the way I expected. By default, the program uses a batch entry mode. When I pressed the Return key to complete a transaction, Liquid Ledger created a new transaction line instead of saving my entry. The same was true when I tabbed through all the fields. I was able to find out out how to turn this option off, which was preferable. Liquid Ledger’s new Accounts window offers one-click access to all of your personal financial information. As of version 2, Liquid Ledger includes an Accounts window, from which you can view and access all your account information. When you open the program, Liquid Ledger displays listings for all your banking and credit accounts. 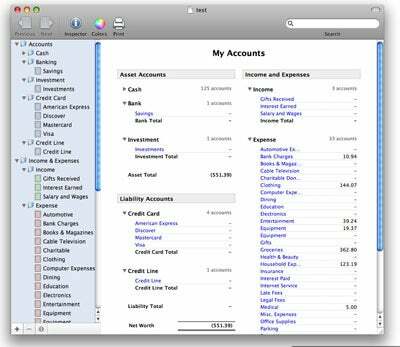 You can view income and expenses, amounts you have in your bank accounts, or how much you’ve spent in each of your expense categories. Clicking once on any of the items that appear in the Account window takes you to a detailed listing of the related expenses and income. Like Quicken, Liquid Ledger ships with a basic set of transaction categories, like groceries, rent, and gasoline. If you choose to create a new account using a file you’ve downloaded from your bank, you’ll need to create all of the categories yourself, as Liquid Ledger doesn’t include a default set of categories for imported accounts. The better alternative is to create a blank account, which does include a set of default categories, and then import your downloaded banking information. You can easily create new accounts or categories by pressing a Plus (+) button in the main account window. Unfortunately, it wasn’t possible for me to create a new category by typing a new name in the category field. I also found that it was possible to create multiple categories with the same name, which could lead to errors in reports and graphs. Once you create a category, Liquid Ledger eases data entry by matching a category to the first few letters that you type in the appropriate field. Liquid Ledger has good, but limited, reporting features, which allow you to get a quick, graphical glimpse of your financial status. There are eight possible reports, three graphs, and five text-based reports, including an Income Statement, Balance Sheet, and Capital Gains and Losses report, which make it easy for you to quickly pin down your current income and expenses. What I missed in both the charts and reports was the ability to simply click on a category or dollar amount to dig down deeper and get more detail about specific transactions. Liquid Ledger 2.0.4’s simplicity makes it appealing as a personal financial application. But those accustomed to more mature programs may be left cold by Liquid Ledger’s limited reporting tools and the way the program handles the entry of new transactions.